• Many Wonderful Golf Courses, including the nationally recognized and championship Blackwolf Run and Whistling Straits Courses, just 40 minutes away at Kohler. Costello's Irish Guest House sets on a spacious lawn graced by majestic oak trees. This large home was built by Daniel Costello, son of Irish immigrants Daniel and Ann Claugher Costello, in 1879. He built the original part of the home for his bride, Martha Lloyd. Dan and Martha raised their six children in this home as they worked their 100 acre farm. In 1933 their youngest son, Chester, married and took over the responsibilities of the farm. Today, this home remains on a working farm in the Costello family. Picture yourself settling back into the old porch swing on the spacious porch that spans the front of this gracious home. The porch overlooks the neighboring fields and in the distance you will see the "Fond du Lac Ledge", which is an extension of the Niagara Escarpment. You may play a game of croquet, or just relax and enjoy the scenery... and when you're ready, you can have another swing on the oldest of the oaks. This home is completely furnished with AC and WIFI - ready for you to enjoy the smoke-free environment, be it with your family or group of friends. There are four bedrooms; two twin, one queen and one single, which can accommodate up to seven persons. There is a full bathroom on each floor and a stairway at the front and rear of the home. If you care to cook on your own, the kitchen is fully equipped. If you decide to enjoy the outdoors, there is a grill and picnic table available for your use. As our guests, you will be welcome to enjoy the grounds or take a leisurely stroll down the old lane. As you walk, you'll hear the rustle of the breezes in the corn fields and see it gently turning the heads of the wheat. You may see the great flocks of Canada geese that frequently cross over the neighboring ponds to the nearby Horicon Marsh. You might also catch a glimpse of neighbors such as deer, sandhill cranes, fox and more. If it is a rainy day, your family or friends can join you for a game of pool in the "old kitchen". 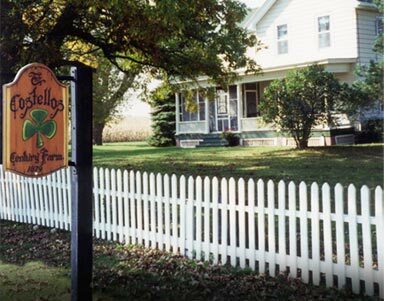 Costello's Irish Guest House is a state licensed tourist home conveniently located one mile south of Fond du Lac and is available for rent to one family or group at a time.